The next Whitbread Brown Ale is much more typical of the 1950’s. Weak, sweet and spun out of a Mild recipe. Every brewery in the country had a beer along these general lines. And very popular beers they were, too. Mostly off the back of poor draught beer quality rather than on their own merits. Falling gravities had left many landlords struggling to keep their draught beer in decent condition. Bottled beer was more reliable, but also quite a bit more expensive. The answer? Mix bottled Brown Ale and draught Mild. Not as dodgy as pure draught, but cheaper than a pint of bottled beer. 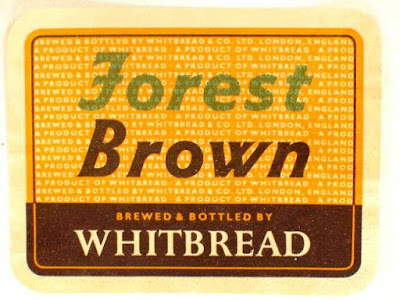 Forest Brown wasn’t originally a Whitbread brand. It came from the Forest Hill Brewery, which Whitbread bought in the 1920’s. Bottling was the reason of the purchase. Because Whitbread had insisted on sticking with bottle conditioning past WW II, which was quite unusual. Especially as Whitbread had an unusually large trade in bottled beer. When they finally decided to move into artificially carbonated beer, they brought in the expertise by buying the Forest Hill Brewery, which were quite big in that type of beer. Forest Brown long outlived the brewery that spawned it. It was still Whitbread’s principal Brown Ale when I was drinking in the 1970’s and 1980’s. Not that I ever tried it. Mostly because I rarely drank in Whitbread pubs, as they had pretty much eradicated cask in their pubs in the Midlands and the North. And I didn’t drink Brown Ale. You’ll see that the grist is quite different from Double Brown. Both beers have a similar amount of No. 3 invert, but the malts are completely different, Forest Brown having a base of mild malt with a fair whack of crystal, while Double Brown is PA malt with just a touch of chocolate. Unsurprisingly, given its far lower gravity, the hopping in Forest Brown is much lighter. I’ll not detain you any longer having nothing further sensible to say . . . .
How did they mix bottled and draft beer? Was it 12 oz from the bottle topped off with 4 oz from the keg? Or was it some kind of more ad hoc method of mixing it up? you're thinking in US measures. Half pint bottle (10 oz) and a half pint of draught.